Printed & distributed in England by The Magazine Printing Company, using only paper from FSC/PEFC suppliers. www.magprint.co.uk Information carried in Mortgage Introducer is checked for accuracy but the views or opinions do not necessarily represent those of Mortgage Introducer Ltd. The inaugural Mortgage Introducer Scottish Mortgage Awards took place last month at Edinburgh’s prestigious Ghillie Dhu. With focus so often being on London and the rest of England and Wales we launched the SMAs to celebrate the people, products and services that demonstrate excellence and originality within the Scottish intermediary mortgage market. Recognising and rewarding the best and brightest in the Scottish mortgage industry – individuals and businesses who stand out from their peers through their innovation and professionalism – is no easy task. With 17 categories and nearly 7,000 votes cast our 63 strong panel of judges had their work cut out. Hosted by comedy legend Fred MacAulay, the evening wasn’t just about shining a spotlight on the best of the best from Edinburgh and Glasgow. For the first time brokers from the regions also had a chance to shine, including those from Aberdeen/ Northern; Dumfries and Galloway; Dundee and East Fife; Perth, Stirling and Falkirk as well as the Highlands and Islands. And it wasn’t just brokers who took home the spoils The SMAs also rewarded Scotland’s best building society; lender; specialist lender; later life lender; GI provider; distributor as well as Scotland’s best business leader – an accolade that was collected by Barclays’ Graeme Muirhead, while a special lifetime achievement award went to Lloyds’ Douglas Cochrane. Congratulations to all our winners but also to all those who made the shortlist – no mean feat amongst such strong and diverse competition. A special thanks goes to all our sponsors, but especially our headline sponsor Barclays and our platinum sponsor, The Lending Channel as well as our media partner, UK Finance and our charity partner Crisis, the national organisation for homelessness. To find out who made the grade and who took the top prizes, read on. as Scotland’s trusted mortgage expert. At Carrington Mortgage UK we’ve been helping people with mortgage and protection needs since 2014. Having just celebrated our 5th anniversary, we are committed to delivering an unrivalled level of service to our customers and the stakeholders with whom we work. We’re committed to helping clients at a time and place that suits them and with offices in Glasgow, Edinburgh, Aberdeen, Fife and Inverness, our aim is to make getting a mortgage simple and straightforward. 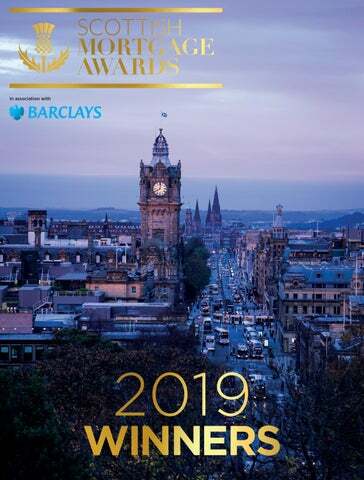 Named 2019 Best Overall Broker for Scotland and Regional Best Broker for Aberdeen & Northern. We’re excited to continue our growth in 2019 by further strengthening our proposition, including Equity Release, Limited Company Buy to Let and Portfolio Landlord sectors of mortgage lending. As a growing business in Scotland we’re dedicated to further developing our corporate client relationships as well as our ongoing commitment to help customers buy their dream home or save money on an existing mortgage arrangement. So, if you work in the home buying industry, or if you’re looking for a mortgage, Carrington UK has access to thousands of mortgage deals helping first time buyers, buy to let customers, homemovers and those looking to remortgage. Simple and straightforward mortgages. Contact us today to get started. NOT EVERYONE FANCIES 9–5, OR 2.4 KIDS — BUT WE DON’T SEE THAT AS A REASON TO STOP THEM FROM GETTING THEIR PERFECT MORTGAGE. REAL LIFE NEEDS REAL LIFE LENDING. THAT’S WHERE WE COME IN. CHALLENGE THE STATUS QUO VISIT THEMORTGAGELENDER.COM OR GIVE US A BUZZ ON 0344 257 0418. Building for the future since 1848 At the Scottish, we’ve been helping people in Scotland buy their homes for 171 years. As Scotland’s only independent building society and a mutual organisation, we’re committed to giving all our customers a more personalised service. We underwrite every case individually and offer a range of specialist mortgages so customers can get the one that’s perfect for them. Rewarding Membership Scottish Building Society is authorised by the Prudential Regulation Authority and regulated by the Financial Conduct Authority and the Prudential Regulation Authority (Register No. 206034). Member of the Building Societies Association and UK Finance. Scottish Building Society, SBS House, 193 Dalry Rd, Edinburgh EH11 2EF. PROPERTY WIRE IS A MULTI-CHANNEL PROVIDER OF NEWS, DATA AND EVENTS. WE REPORT ON, AND SUPPORT THE UK PROPERTY INDUSTRY BY DELIVERING THE LATEST MARKET DEVELOPMENTS, EDUCATIONAL GUIDES AND NETWORKING OPPORTUNITIES ACROSS THE COUNTRY. A proposition worth shouting about. At Newcastle Intermediaries we’re constantly improving our product range, criteria and service. We work closely with Intermediaries and value their feedback to shape our proposition, which is designed to reflect their clients’ lifestyle today. Precise Mortgages is a trading name of Charter Court Financial Services Limited which is authorised by the Prudential Regulation Authority and regulated by the Financial Conduct Authority and the Prudential Regulation Authority (Financial Services Register Firm Reference Number 494549). Registered in England and Wales (company number 06749498). Registered office: 2 Charter Court, Broadlands, Wolverhampton WV10 6TD. Rounded square Only use blue and/or white. For more details check out our Brand Guidelines.